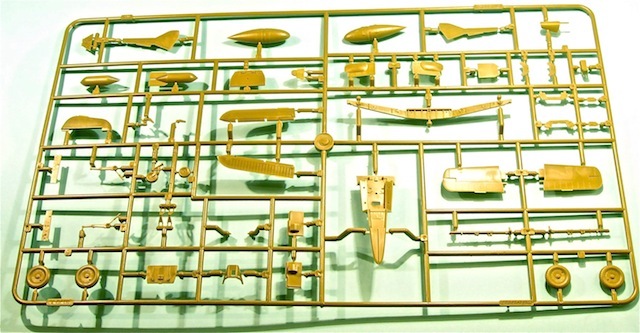 149 olive coloured plastic parts; 10 clear plastic parts; 1 decal sheet containing markings for 1 aircraft; 1 decal sheet containing sufficient stencils for 2 aircraft. A well-presented, high-quality kit of an interesting subject – highly recommended. 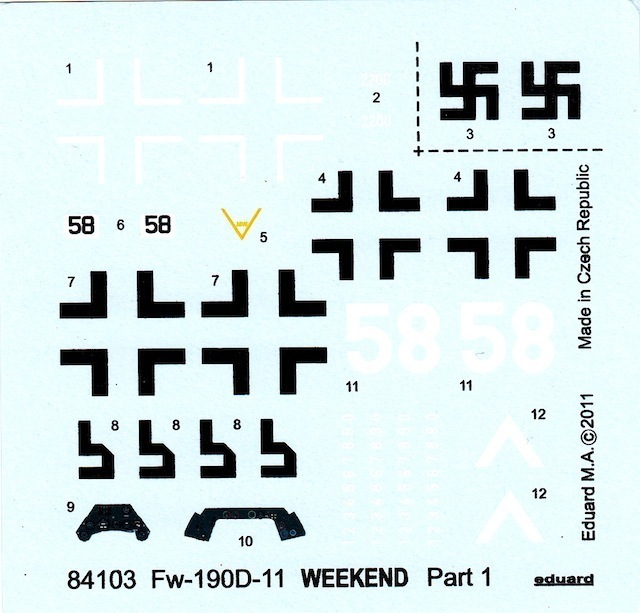 Eduard's 1/48 scale Focke-Wulf Fw 190 D-11 is available online from Squadron.com for USD$12.62! As one of the rarer, final versions of this iconic late war German fighter, the Focke-Wulf Fw 190D-11 has long been a favorite of Luftwaffe enthusiasts and modelers. Aesthetically, the D-11 was one of the more attractive versions of an already good-looking series, with the removal of the cowling machine guns giving the aircraft a leaner, more streamlined appearance compared to the D-9. You can see what I mean by looking at Eric Duval’s recent build of Eduard’s Fw 190D-11 here. There were many other differences between the D-9 and the D-11, including an improved version of the Jumo 213 engine, different propeller blades and two MK 108 30mm cannon added to the outboard wing positions. 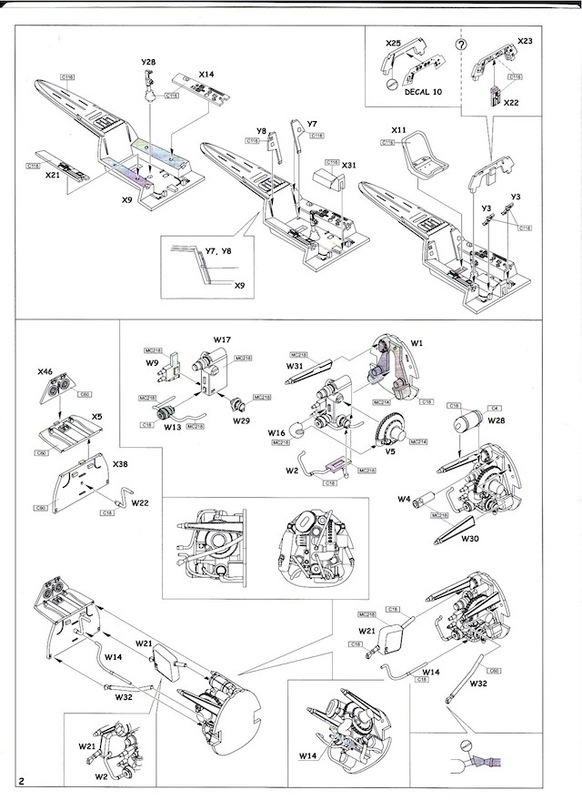 For more information on the D-11 I strongly recommend Jerry Crandell’s marvelous The Focke-Wulf Fw 190 Dora Volume Two: Fw 190D-9/D-11/D-13 (Eagle Editions, 2009), which is an absolute one-stop reference shop for late series 190Ds. 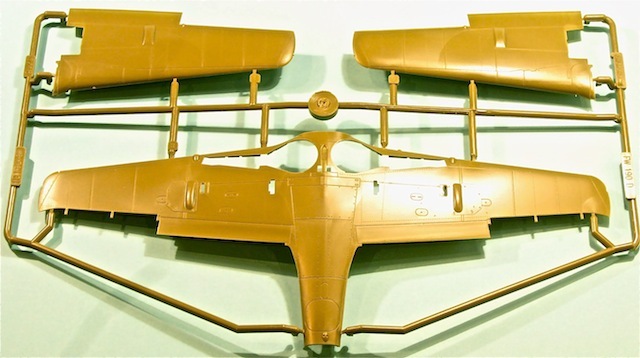 This kit contains the same plastic that Eduard first released in its excellent Fw 190D-11/D-13 Dual Combo boxing back in early 2010, and which was reviewed by Brett here. For its second outing, Eduard has presented the D-11 kit as a ‘no frills’ Weekend Edition – the plastic is the same, but there are none of the photo-etched components, canopy masks, colour painting guides and multiple marking options that were in the Dual Combo boxing. 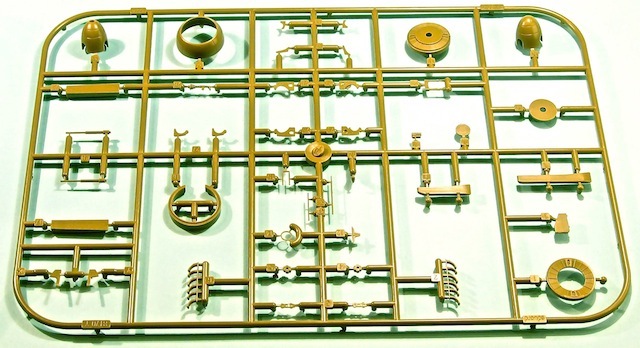 This does not mean that a great model can’t be produced from the kit. 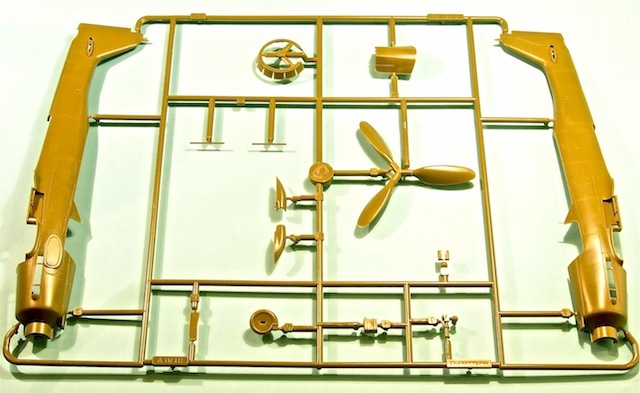 In the box, the plastic parts appear to be of a very high quality, with finely recessed panel lines, appropriately restrained riveting and very little flash. 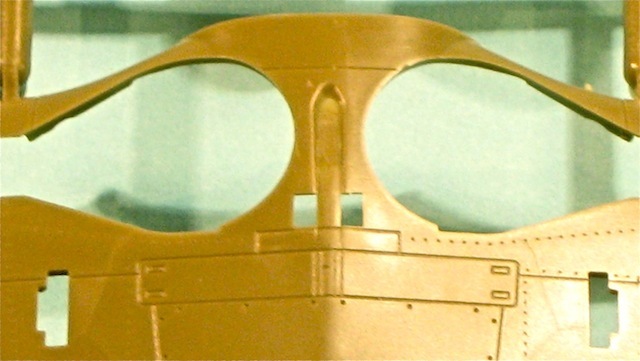 The cockpit will look great with some careful painting and weathering – although unless I was closing the canopy, I would definitely add a photo-etched harness from the spares box. Speaking of canopies, Eduard’s provision of subtly different sliding sections – permitting accurate representations of open or closed canopies – has been frequently reported, but remains a nice touch. 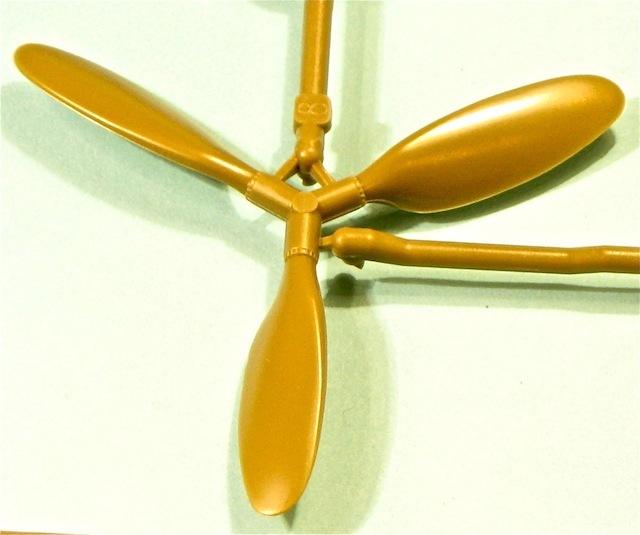 Both original and blown canopies are provided in the kit, although only the latter is needed for the single decal option provided. By all reports, the kit builds up well, certainly with less difficulty than Eduard’s earlier 190 A series. In terms of accuracy, Eduard’s 190 D kits have been largely well received, and in this boxing most of the bumps, curves and panels appropriate to the D-11 version appear to be present. Purists should note that the propeller blades as supplied by Eduard are not quite right. While they are a reasonable representation of the round-tipped VS 9 blades as fitted to the 190 D-13, they don’t capture the angled clipped tips of the VS 9 blades which were fitted to many D-11s, including the aircraft represented in this kit. The bottom trailing edge of the blades should also have a slightly greater ‘notch’ at the point where they meet the propeller hub. However, some reshaping with a sanding stick will easily fix both of these problems. 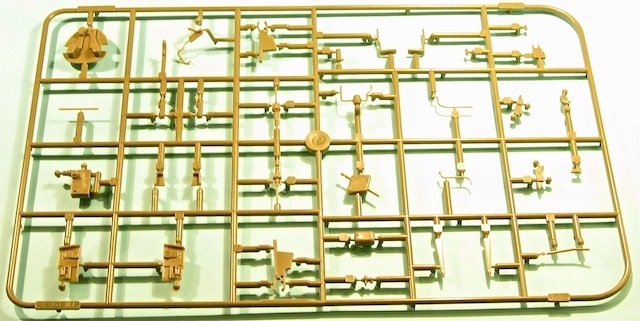 Brett’s review highlights a couple of other, minor corrections to the kit that modelers may also wish to undertake. Decals are provided for one aircraft, “White 58” (W.Nr.220??) of the Verbandsführerschule des General der Jagdflieger – essentially a training school for unit leaders – at Bad Worishofen, Bavaria in March-April 1945. This aircraft is better known for its later use as “Red 4” in the famous flight of brightly coloured 190Ds which flew top cover for the Me 262s of JV 44 at the very end of the war. However, the more sedate “White 58” markings supplied in the kit will still deliver a striking looking model, as Eric’s build of “White 61” – a similarly finished training school aircraft – shows. A point worth making about the decals is that, at some point between the release of the original Dual Combo boxing and this Weekend Edition, Eduard has moved from having Cartograf produce its decals, to doing the job in-house. On the sheet, the Eduard decals don’t look to be of quite as high a quality as the earlier Cartograf decals – there are not as crisply printed, and there appear to be some bits of fluff trapped between a couple of the decals and the backing paper, which could show up on the finished model. This is a minor complaint only, however – I am sure the kit decals will be very useable. 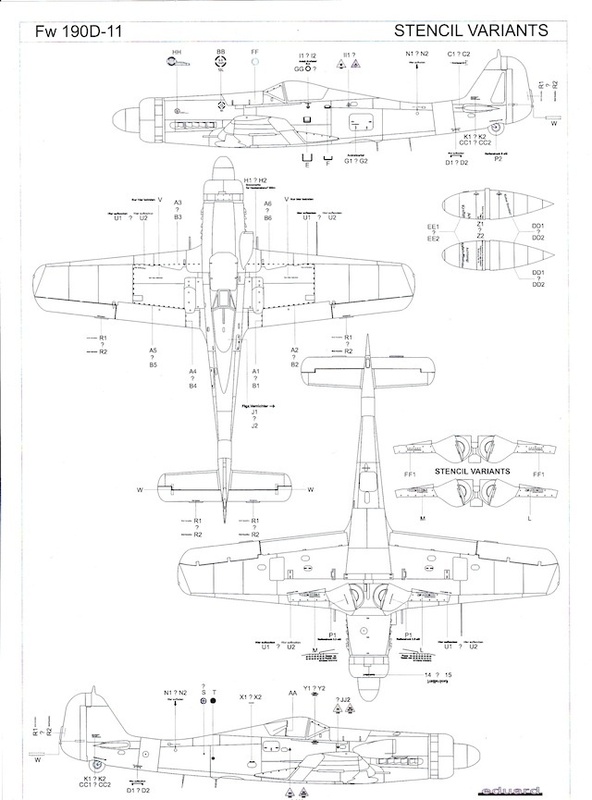 A complete sheet of stencils is also included, with enough provided to complete two aircraft. As is the case with all Weekend Edition kits, the instructions are basic but perfectly adequate. Even the major apparent drawback – a black-and-white painting guide and decal placement scheme – isn’t really a problem, because full-colour side profile and upper camouflage views of the aircraft represented are provided on the kit box lid and sides. Also worth applauding is the excellent stencil placement guide, with its clearly-marked four view drawings which leave no room for confusion. 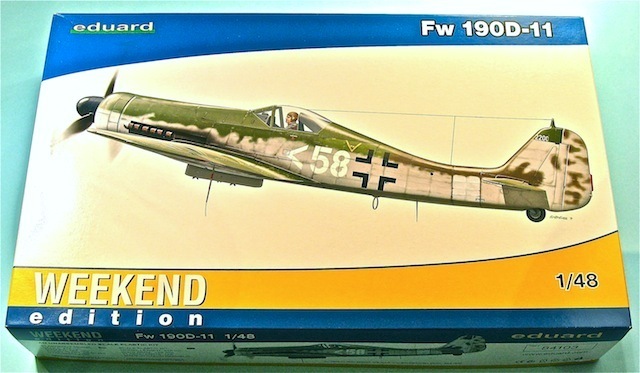 As a largely accurate, highly buildable kit of a popular late war Luftwaffe subject, this Weekend Edition boxing should be a good seller for Eduard, particularly given the price compared to the company’s ProfiPACK and Dual Combo offerings. 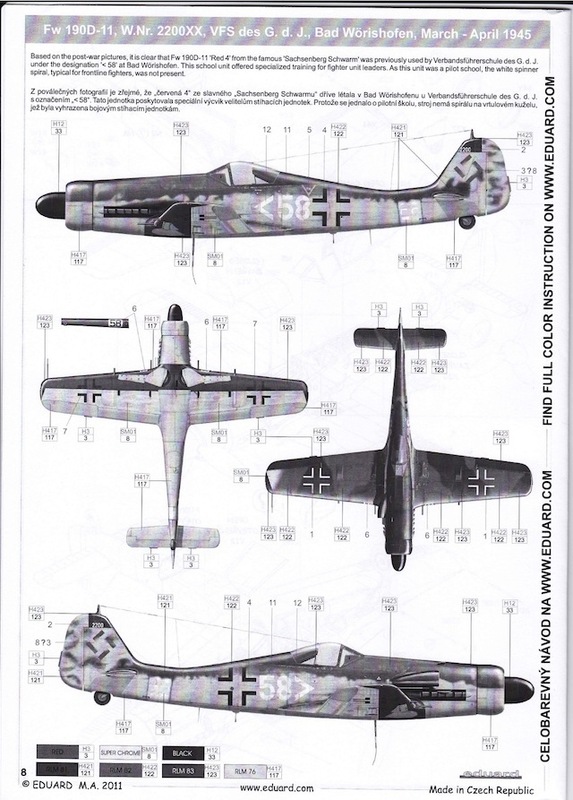 Now that Weekend Editions have been released of the D-11, D-13 and standard D-9 kits, perhaps we can look forward to a similar budget repackaging of Eduard’s 190D-9 Late (Ta 152 tail) ProfiPACK kit? Here’s hoping. Highly recommended.